Home » VectorVest » Reiterate buy Taptica #TAP says VectorVest. More growth to come from this dynamic technology company. 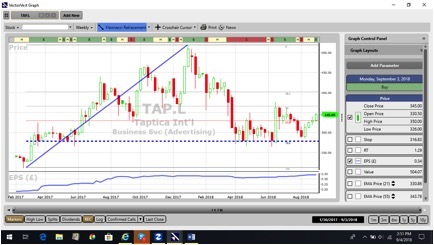 Reiterate buy Taptica #TAP says VectorVest. More growth to come from this dynamic technology company. By Alan Green in VectorVest on 5th September 2018 . AIM listed Taptica International (TAP.L) is a global leader in advertising technologies that operates in more than 70 countries. It has two revenue streams: performance-based marketing, provided by its Taptica business, and brand advertising, provided by its Tremor Video DSP business. The Taptica business is an end-to-end mobile technology advertising platform that helps the world’s top brands reach their most valuable users with the widest range of traffic sources available today. Tremor Video DSP is the leading programmatic video platform, matching advertisers with audiences -wherever they may be. The Company works with more than 600 advertisers including Amazon, Disney, Twitter, OpenTable, Expedia and Zynga. Taptica is headquartered in Israel with offices in San Francisco, New York, Tokyo, Beijing, Seoul and London. VectorVest highlighted the potential of TAP in two blog entries on the 21st March and 11thJuly 2017. At that stage the share was trading at 295p. TAP shares have consistently flagged excellent RV metric readings since that time, (RV is indicator of long-term price appreciation potential), and today logs at 1.4, which is excellent on a scale of 0.00 to 2.00. The key RT (Relative Timing) metric, (a fast, smart indicator of a stock price trend) also logs at 1.29, which is rated by VectorVest as very good on a scale of 0.00 to 2.00, and this is coupled with a GRT (Earnings Growth Rate) metric of 20%, also very good. Today TAP shares have moved higher to trade at 360p, but despite this, the stock is still some way below the latest VectorVest valuation of 504p. A weekly chart of TAP.L is shown above since the listing. The share retraced during the first four months of 2018 to 78% from the listing to January 2018. The retracement occurred in 3 waves which FIB orientated traders consider a corrective waveform within an overall bullish scenario. The share has charted a treble bottom at the very important FIB level and looks set for further gains and an attack on the highs made in January 2018. Summary: In our comments last year, we noted that TAP was ‘in serious growth mode’ despite having already delivered spectacular returns for its early stage shareholders. Since that time, TAP has raised additional funds for a warchest, delivered impressive growth in revenue and profits and paid a dividend. Some may now take the view that the major period of growth is over, but comments from the CEO and a bullish charting picture indicate otherwise. VectorVest believes there is a lot more to come from this dynamic technology company. Buy. Readers can examine trading opportunities on this and a host of other similar stocks for a single payment of £5.95. This gives access to the VectorVest Risk Free 30-day trial, where members enjoy unlimited access to VectorVest UK & U.S., plus VectorVest University for on-demand strategies and training. Link here to view. On VectorVest a simple search using the Unisearch tool will quickly find shares that are undervalued with good fundamentals that have just issued a Buy recommendation. This will give the active trader a short list of many high probability trading opportunities each week. Traders now have the opportunity to spend five weeks discovering VectorVest’s unique simplicity, automation and independent guidance. Just £5.95 buys a 30-day trial to enable deep exploration, or how the system can assist in smarter trading in as little as 10 minutes a day. Powerful tools. Proven strategies. Unique Perspectives.